Newage Testing Instruments provides an assortment of accessories for all your Rockwell testing with a comprehensive list of the most common accessories available. Newage Testing Instruments provides an assortment of accessories for all your Rockwell testing. Below you will find our lists of the most common accessories available. Please contact Newage Testing Instruments for assistance. Indenter, diamond, C & A scales, with certificate. Indenter, diamond, N scale, with certificate. Indenter, diamond, C scale, with certificate. Indenter, steel, 1/16", with certificate, with 50 extra balls. Indenter, tungsten carbide, 1/16", with certificate. Indenter, steel, 1/8", with certificate, with 10 extra balls. Indenter, tungsten carbide, 1/8", with certificate. Indenter, tungsten carbide, 1/4", with certificate. Ball component, steel, 1/16", 50 balls. Ball component, tungsten carbide, 1/4", with certificate. Cabinet, floor-standing, with locking door and drawer. Anvil, flat, 3/4" post-type for external jack support, shank 3/4". Anvil, spot and vee combination, shank 3/4". Anvil, vee, self-aligning cylinder-type, for NI-SP11 and NI-SP12, shank 3/4". Anvil, diamond, spot-type, shank 3/4". Adapter, clamping, for any INDENTRON tester, includes extended C scale diamond and 1/16" ball indenter. Indenter, diamond, special, for use with NI-SP22 clamping adapter. Anvil, spot, 2" extended, includes locking ring, shank 3/4". Indenter, diamond, short form type. Indenter, tungsten carbide, 1/16", short form type. Brinell conversion package, digital, uses 187.5 kgf load, 2.5mmball, for carbon steel, HB30 100-400. 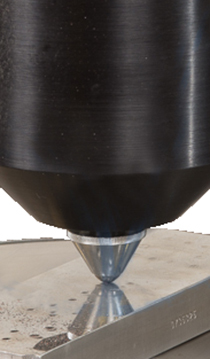 Brinell conversion package, digital, uses 187.5 kgf load, 2.5mm ball, for cast iron, HB30 100-400. Brinell conversion package, digital, uses 125 kgf load, 5mm ball, for light alloys, HB5 40-200. Indenter, diamond, N scale, with certificate, tapered for use with shroud 5404. Indenter, diamond, C, A and D scales, with certificate, tapered for use with shroud 5404. Indenter, diamond, N scale, superficial, with certificate. Indenter, steel, 1/16", with 50 extra balls. Indenter, tungsten carbide, 1/16", B, F, G and T scales, with certificate. Indenter, steel, 1/8", with 10 extra balls. Indenter, tungsten carbide, 1/8", E, H, K and W scales, with certificate. Indenter, tungsten carbide, 1/4", L, M, P and X scales, with certificate. Indenter, tungsten carbide, 2.5mm, HB/30 Brinell scale (requires optional Brinell conversion package). Indenter, tungsten carbide, 5mm, HB/5 Brinell scale (requires optional Brinell conversion package). Anvil, diamond, spot-type, shank 25 mm. Anvil, flat 2", shank 25 mm. Anvil, spot-type, shank 25 mm. Anvil, vee-type, small, shank 25 mm. Anvil, vee-type, large, shank 25 mm. Anvil, tapered, large, shank 25 mm. Anvil reducer kit, includes mini spot, mini vee and mini spot vee anvils. Anvil, ball-type, flattened, for non-parallel surfaces, shank 25 mm. Anvil, ball-type, flattened, with vee notch for tapered rounds, shank 25 mm. Anvil, vee, cylinder-type, adjustable with interchangeable cylinders, shank 25 mm. Clamping shield, enclosed, 1.7" length. Shroud, indenter, regular, 0.396" length. Shroud, indenter, fully enclosed, 0.396" length. Shroud, indenter, pointy nose, 0.396" length. Shroud, indenter, pointy nose extended, 1.7" length. Shroud, indenter, double tapered, 0.396" length. Shroud, indenter, double tapered with extension, 1.7" length. Shroud, indenter, double tapered with extension, 1" length. Shroud, indenter, pointy nose extension, 1" length. Light, flex arm illumination test point, with magnetic base. Alarm, HI/LO, audible, for advanced test heads only (test head cannot be upgraded in field). Cover, vinyl, fits Versitron N-type models. Cover, vinyl, fits Versitron T-type models. Cover, vinyl, fits Versitron 2DS and 2DB models. Indenter, tungsten carbide, 2.5mm, with certificate (requires optional Brinell conversion package). Indenter, tungsten carbide, 5mm, with certificate (requires optional Brinell conversion package). Anvil, diamond, spot-type, shank 1".